Be it ever so humble, a loupe is among my most used pen accessories. I use it to examine the condition of pens and nibs I’m thinking of buying, but mostly I use it when I adjust nibs I already own. I am a pen tinkerer, so I use it a lot. 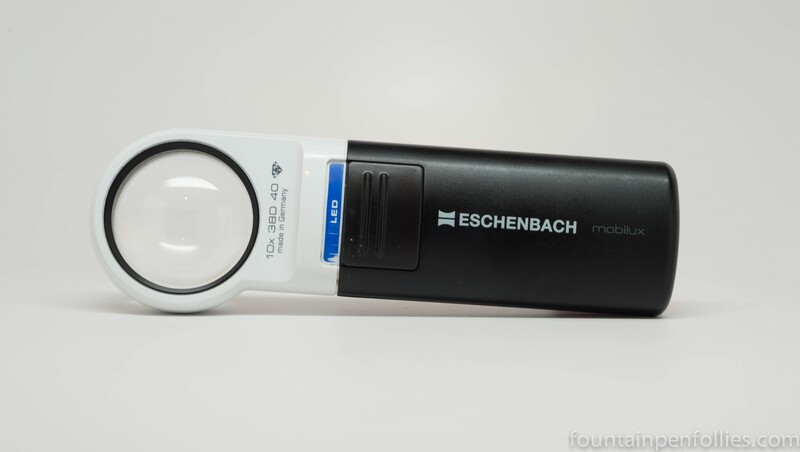 Mine is a 10x loupe made by Eschenbach with an LED light. It’s just great. The optics are excellent, the 10x magnification level is perfect for examining nibs and the integrated light means I can use it in any lighting and get a great view of the nib. This loupe is about six inches long, which is small enough to bring to pen shows. The handle makes it easy to hold. It comes with a vinyl cover to protect the lens when not in use. I know it’s sturdy: it has passed the “dropped by Laura” real-life test more than once. I can’t think of a single thing that isn’t excellent about this loupe. But it was pricey, at a little over $100. You could economize by looking for a less expensive one, though check the quality and the magnification. Unfortunately, the lighted magnifiers that you see everywhere for reading provide only 2x or 3x magnification, which I don’t think is enough for nib work. But there are a lot of unlighted loupes, and even some magnifying glasses, with 10x magnification. 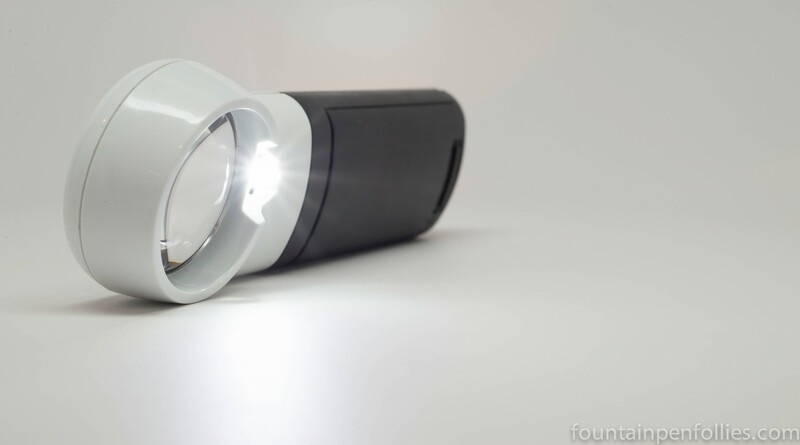 So if you don’t need the illumination, you also could save money on a loupe purchase by foregoing the light. I have a no-name folding loupe with light I got for 15 (~$17) I got from a local office and art supply chain. It’s supposed to be x15, but I don’t think stronger is always better because it’s pretty hard to hit the range where there’s no distortion. Still, it’s probably plenty for non-tinkerers!